The Ferrari 812 Superfast, as the name connotes “8-12,” boasts of an entirely new 12-cylinder engine with 800hp output. Ferrari. It is no doubt one of the most famous, most prestigious and sought-after “F” words in history. On April 11, 2018, Ferrari highlighted another “F” word it is renowned for: Fast. To this day, Ferrari is the only manufacturer to have continuously produced sports cars with 12-cylinder engines. But the latest Ferrari to debut in the Philippines is not just fast—it is “Superfast,” literally. The Ferrari “812 Superfast” ushers in a new era in Ferrari 12-cylinder history. 812 is an easy reference for two outstanding features: 800 horsepower and V-12 engine. Its 6.5-liter V12 engine unleashes 800cv, with a maximum power output of 8,500 rpm and a maximum torque of 718Nm at 7,000 rpm. These figures have never been seen in any car of this class, setting a new benchmark in the front mid-engine sports car segment. 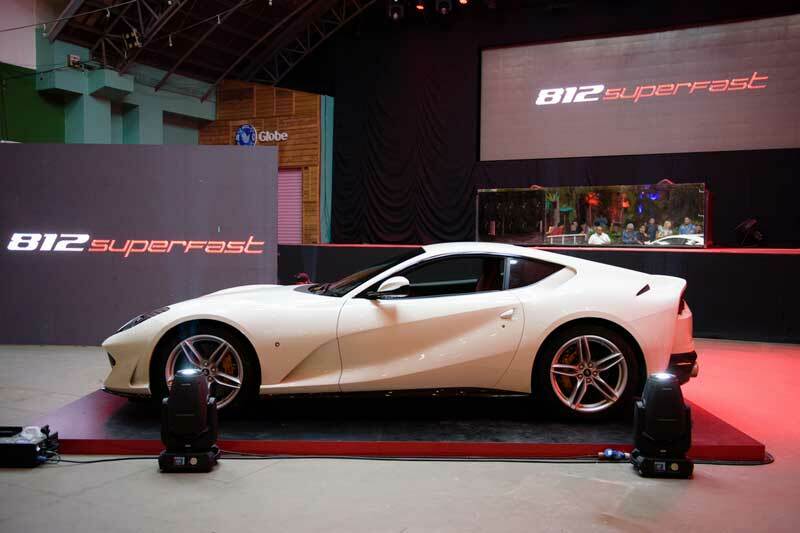 True to its name, the 812 Superfast can go from zero to 100 km/h in 2.9 seconds, and zero to 200 km/h in 7.9 seconds. It has a maximum speed of 340 km/h. The 812 Superfast is the first Ferrari to adopt Electric Power Steering (EPS) along with the Virtual Short Wheelbase 2.0 system (PCV). The PCV, which combines electric front-wheel steering assistance with the mechanical concept built around tire dimensions and the rear-wheel steering, is integrated with the vehicle dynamics control system based on the latest 5.0 version of Side Slip Control (SSC). The result is unparalleled, nimble handling with reduced vehicle response times. 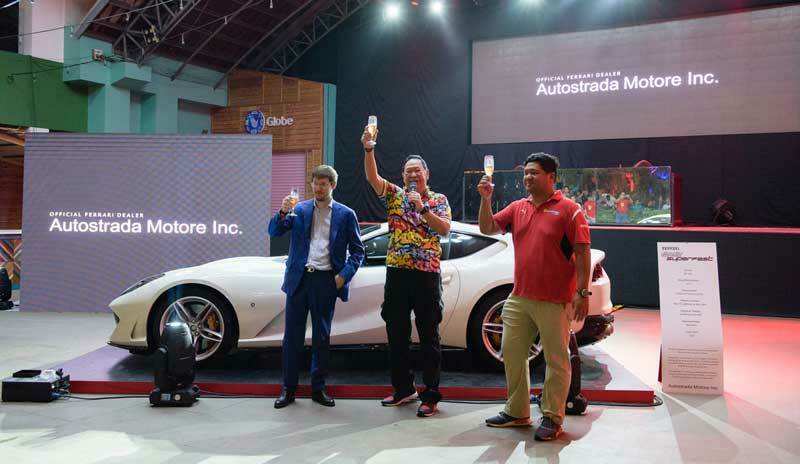 Celebrating a milestone in Ferrari’s V12 History: Autostrada Motore chairman and president Wellington Soong (center) offers a toast with the Italian Embassy’s First Secretary and Deputy Head of Mission Fabio Schina (left) and Autostrada Motore executive director Marc Soong (right). On display at The Island in Bonifacio Global City was a Ferrari 812 Superfast in Bianco Avus (white color). Standing at a length of 4,657mm, a width of 1,971mm, and a height of 1,276mm, the 812 Superfast is the size of a typical two-seater sports car. But it is imposing, eye-catching and figuratively “larger than life” as a super car. The 812 seamlessly integrates elegant and sporty style with aerodynamic solutions to make it the fastest, yet one of the most beautiful Ferraris to date. 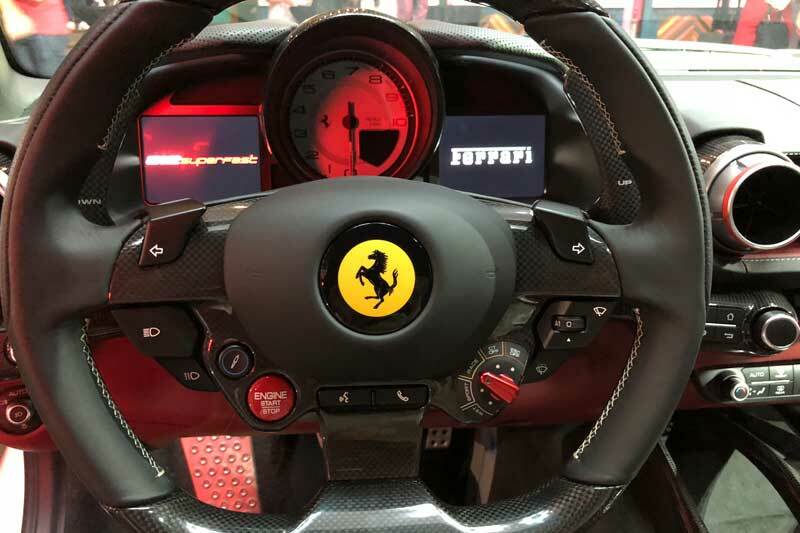 The Bianco Avus on display featured carbon fiber options, which shows the level of customization that the 812 allows its owners. The interiors give a sporty, yet luxurious feel with ergonomically designed Bordeaux red leather seats, high-tech steering wheel, and modern infotainment system. As I sat on the driver’s seat and revved-up the 812—a beautiful, naturally aspirated exhaust sound underscored its engine’s power. With the excitement brought about by the mere sound and appearance of the 812 at the event, one can imagine the unparalleled pleasure that comes from driving a Ferrari 812 Superfast. The 812 Superfast is now the highest performance and most powerful Ferrari car of all time. As Ferrari marks the 70th anniversary since it released the first Cavallino Rampante sports car “125 S” in 1947, the 812 Superfast ushers in a new chapter in Ferrari V12 engine history. 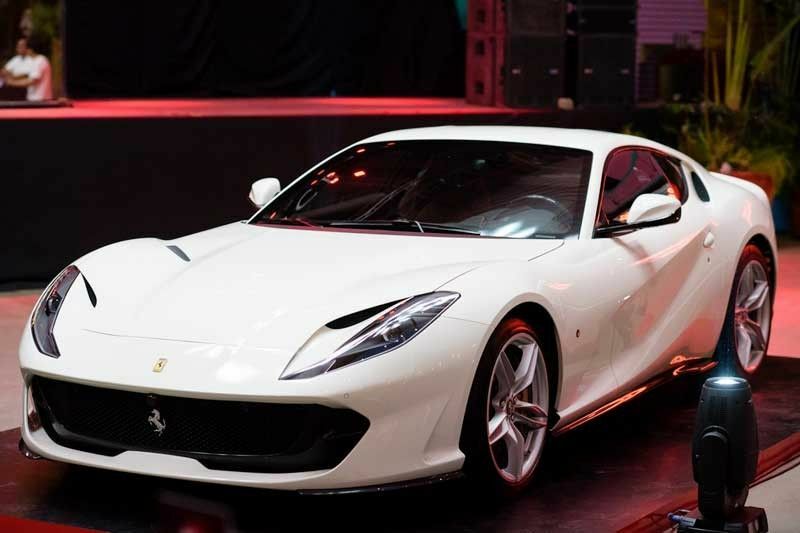 “After intensive research and development, this is what they achieved with the 812 Superfast—the fastest and most powerful 12-cylinder engine in the 70-year history of Ferrari,” said Autostrada Motore Inc. Chairman Wellington Soong. Will the Ferrari 812 Superfast be the reigning FASTEST Ferrari for a long time?